Over the course of nearly 30 years of furniture making, my tastes have gone from English traditional and, since I have been living in Germany, to Biedermeier, Art Nouveau and, more recently, Art Deco. When I decided to make a sideboard for us I spent six months deliberating between these styles before discovering Chinese lacquered furniture. I can't take too much credit for the design as it is typically Chinese, although without the drawer pulls, door fitting and shape of the bracket feet it could be modern-day European. At the moment far-Eastern furniture is 'in', at least in Germany and, judging by my researches on the internet, it seems to be so in the UK too. Considering it is mostly good quality, this furniture is not expensive. One shop even offered to have a sideboard like this one made for me in China, to my specifications, and to ship it in the next available container, at about the same price that I could make it for myself. This reproduction work is made in China from recycled wood, with all the traditional Chinese joints, see page 59, and with the patina of antique furniture. Sadly, it is constructed by poorly paid workers who live in a different economy from us in the west. I gave myself the brief for this sideboard: it had to look like the pieces I'd seen in my researches, be structurally sound, but without the intricate Chinese joints. 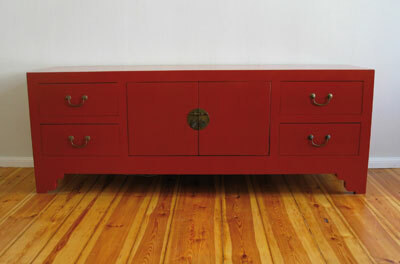 As the piece was to be painted I allowed myself the use of MDF because it was to be painted to give a lacquered effect. I did wince a bit at simply gluing on the top to the carcass, but you can do that with man-made materials. 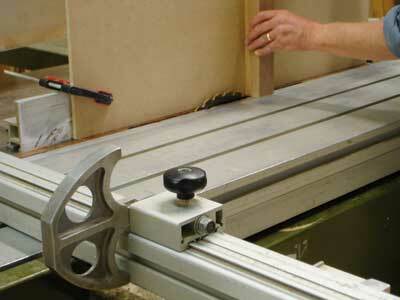 Incidentally, if you should want to make the same sideboard with a solid top you must button the top on, or use shrinkage plates, as the carcass won't move from front to back whereas a solid piece of timber will. Otherwise, you could always frame and panel the top and, in true Chinese fashion, mitre the corners and let in through-tenons. But as I said, this is a cheat's sideboard! 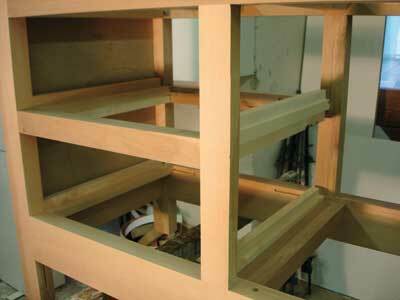 For the carcass I used alder (Alnus glutinosa) because it is nice to plane and takes paint well. The panels and top are made from 10mm MDF, and the drawer linings, including fronts and bottoms, are all from quarter-sawn beech (Fagus sylvatica). 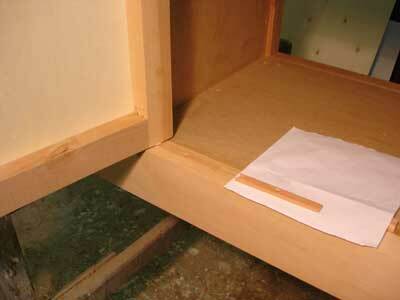 The drawer runners are maple (Acer spp). 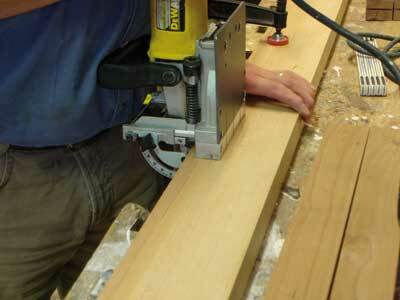 With all the frame components planed and dimensioned to size, the first job is marking out. I chose mortise and tenon joints for the front and back frame because with such a long piece I didn't feel confident using dowels or biscuits. I guess the ends could be biscuited front to back, especially if the MDF panels are glued in to give more strength to the end frames. 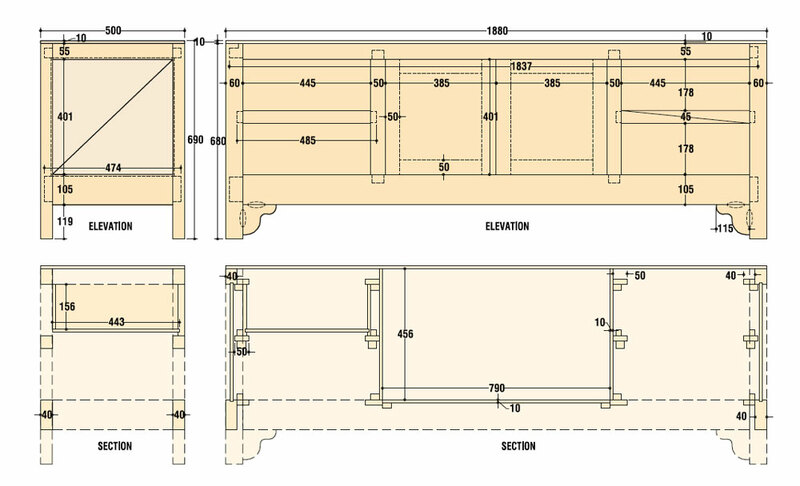 Also, the timber sections could be lighter. 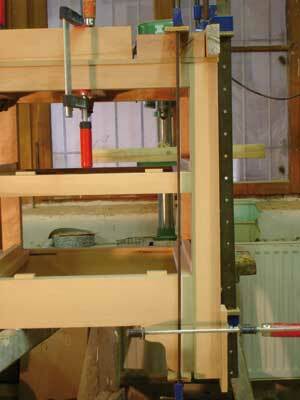 I used 50mm stuff planed down to 40mm for the whole framework. You could get away using this just for the corner posts and front and back top and bottom rail, and then, say 25mm material for the rest, but standardisation does make things quicker from a planing, marking and tenon-cutting point of view. 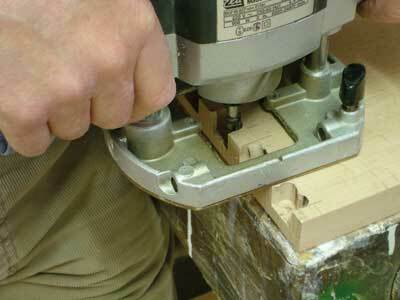 There are many ways of cutting mortise and tenon joints, depending on what resources you have to hand. My first choice is always to use a machine for the mortises and a tablesaw for the tenons, but currently having no mortiser, I drilled out between gauged lines and pared out the waste with a chisel, photo 2. 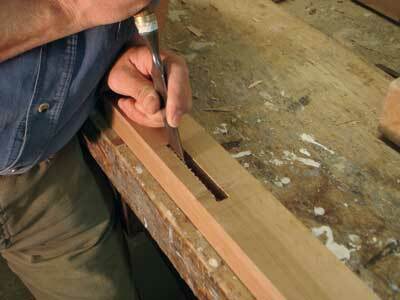 A big help is making your mortises as near as possible to your chisel sizes! I left horns on the top end of the corner posts so the end grain didn't split out during my chisel work. The haunches, photo 3, were cut with a saw and a chisel after the horns had been removed. 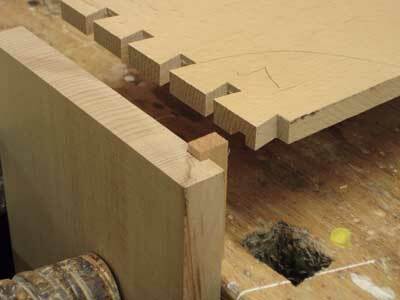 Don't forget the set-backs in the joints for the end panels. 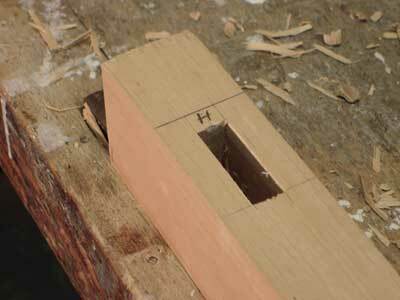 I cut the tenon cheeks on the circular saw, photo 4, with a board clamped on for stability, and the shoulders, photo 5, were also cut on the saw using the sliding table and end stops. I deemed biscuit joints, photo 7, good enough to joint the front to back rails - there are enough of them, plus with the top glued on, nothing much can go wrong. 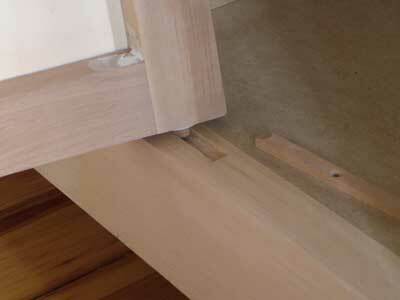 The drawer runners were mortise and tenoned, however; I like to think they can be taken out and renewed one day. 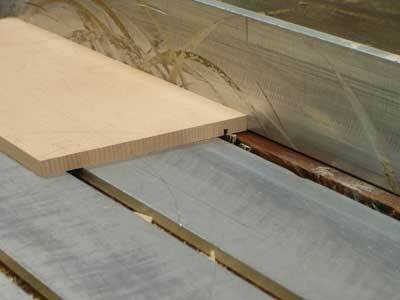 The grooves for the end panels are cut using a router, photo 6, and fence, as are the mortises for the runners. The doors are hung on beech pegs. To plot the door movement, photo 8, and how much of the pillars to relieve, I cut a piece of paper to the thickness of the door and pinned it to the bottom rail. 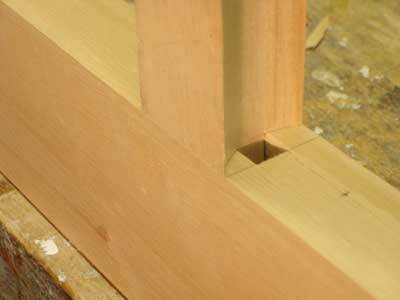 It is quicker and neater to run the groove on the pillars right through, photo 9, which removes part of the tenon, and then glue a bit back on later. 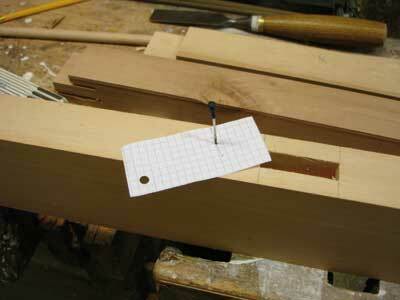 With the holes drilled top and bottom in the frame, cut out the small channel to facilitate easing in the bottom peg. While I was doing a dry run with the carcass, photo 11, a colleague came into the workshop who proudly told me he had never done that in his whole career, instead gluing straight up and trusting his work. Good for him, and in some instances this is possible, but too many things can go wrong; something not quite aligned, a joint wants easing once they all go together, and gluing up can be fraught enough so it's good to have had a dummy run. 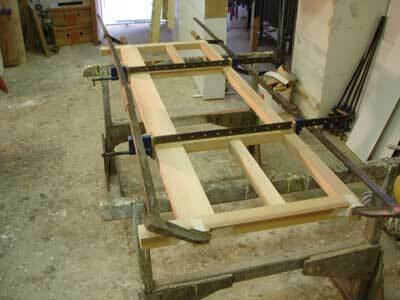 I glued up on trestles, photo 10, which allowed me to work at a sensible height while fitting all the cramps. Because the tenons in the end frames are so short, they do not have too large a gluing surface even though they are mitred where they meet those of the front rails, so I pegged them - belt and braces maybe, but this is rather a large piece. Start moving it around a few times in its lifetime, especially up and down staircases here in Berlin, and there will be some stress put on the joints. The drawer work, photos 13-17, was started once all the quarter-sawn beech was planed to thickness, 12mm for the sides, 10mm for the bottoms and 22mm for the fronts. 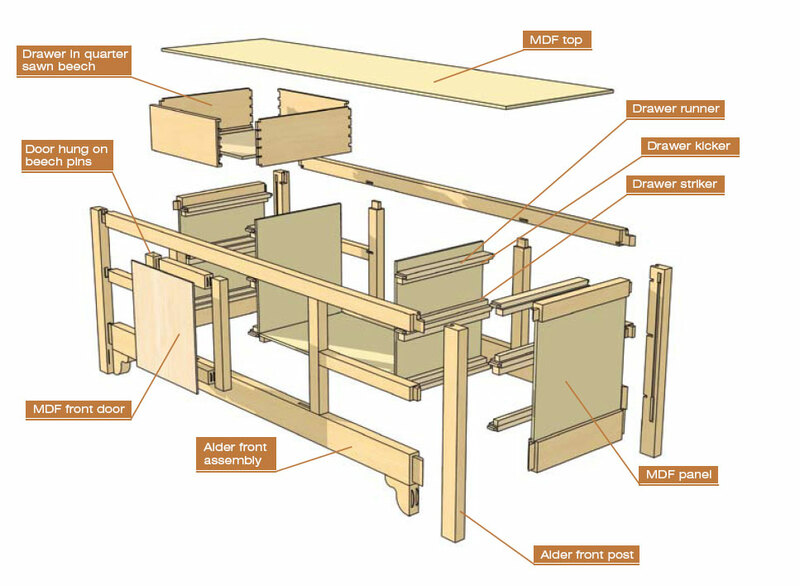 So many good articles have been included in F&C about drawer making over the past couple of years that I see no need to add to them. 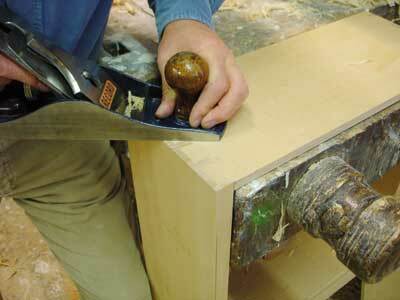 I also assume if you want to make a cabinet similar to this, you won't be an absolute beginner. I will, however show my way of keeping track of drawer components during the making. Here again, probably stuff you have already gleaned from the same books I read whilst learning, ie Furniture Making by Earnest Joyce, and all of the Charles Hayward books. 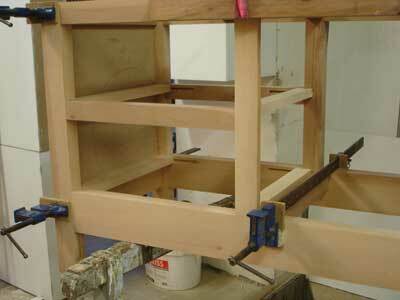 The drawer runners, photo 12, were fitted after the carcass was glued up; I find this method more accurate, but you must make the mortises in the back rails longer to accommodate their location. 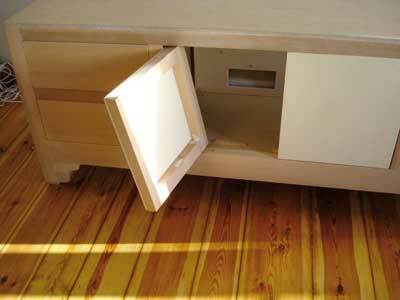 Kickers were glued to the undersides for the drawer below, and strikers directly onto the runners. The runners themselves aren't glued into their mortises. Well yes, it was a bit of a faff hanging these, and possibly not the best solution to not seeing any hinges, but it's interesting to try different things once in a while. One other alternative would be to hang them on modern kitchen door hinges on the inner cheeks, then there would be no need to relieve the door pillars for their movement, but having come this far already I stayed with the idea. 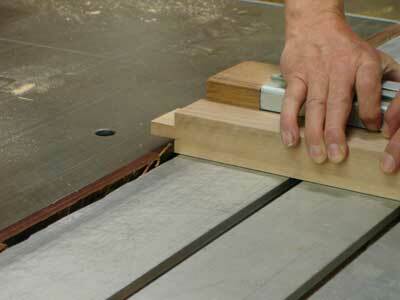 To get the top and bottom hinge pins in, the top of the door has to be planed at a slight angle, and a groove running up to the bottom hole needs to be cut, photos 20-22. I don't know what sort of life expectancy the beech dowels will have, but I made some plastic washers to slip under the doors so they don't run directly on the bottom rail. 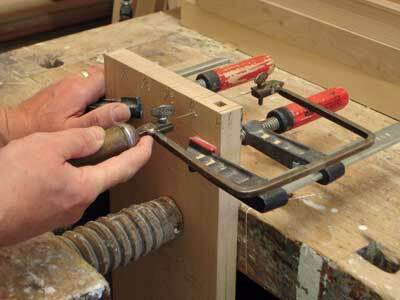 Should the dowels ever wear out, it will be simple enough to drill them out, rebore the holes and replace them. The doors are made from 50 x 38mm alder, butted and biscuit jointed, photo 18, and with 6mm ply glued on the fronts. 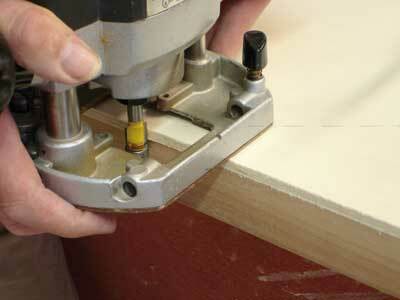 The bottom and cheeks behind the doors are made from 10mm MDF and screwed to the carcass assembly. The bracket feet, photo 18, are fitted with biscuit joints. 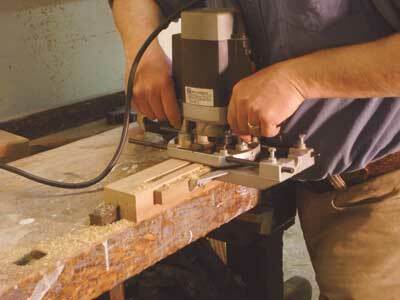 "A big help is making your mortises as near as possible to your chisel sizes!" Before the final sanding I wet all the solid timber to raise the grain, but not the MDF which received a light sanding to act as a key for the paint. Achieving the right colour took a while and I tried several different reds. 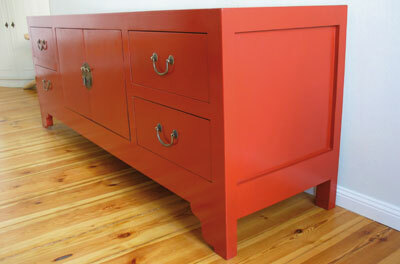 What gave a super finish was Osmo black wax oil followed by Osmo red wax oil, but it wasn't the correct shade of red. I finally settled for an acrylic weatherproof black made by Consolan followed the next day by an application by roller of Osmo's high solid opaque satin matt in Signal Red from their Country Colour range.